Stabilizes shoulder and upper trunk with some reduction of tone in biceps. 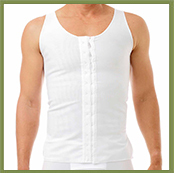 A long sleeved vest will reduce tone in the forearm extensors. Improved trunk posture, body symmetry, shoulder stability and upper limb awareness. Fine motor control improves. 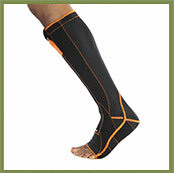 Reduces tone in gastrocnemius and Soleus. Proprioceptive awareness increased. Also affects the Tibialis Anterior where there is lease minima within the gait cycle. May improve weight bearing and balance, and active dorsiflexion in gait cycle. Elbow, forearm, wrist and fingers. Introduced in the treatment of children with a diagnosis of cerebral palsy. Early studies found that by putting children in suits, body alignment and trunk control improved, sensory and motor feedback were influenced and learning strategies enhanced (Edmonson, Fisher & Hanson 1999). 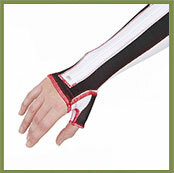 The Sensory Dynamic Orthosis (SDO) is a made to measure Lycra garment (Class 1) medical device, designed and produced to the finest detail. It provides dynamic compression to increase sensory and proprioceptive feedback as well as provide musculoskeletal support. Any abnormality in tone may lead to impaired movement, which will impact, on the sensory system. In order for people with abnormal muscle tone to achieve control over movement, suitable stimuli are required. These can be provided through any of the senses using many different therapy techniques. The sensorimotor feedback loop, therefore, is a key component to effective learning in any person. Postural control is essential to stabilize the body in order for a movement to occur. To achieve this effective sensory feedback is required to maximize motor output. It is known that by improving proprioceptive feedback we can enhance the accuracy of movement and tone through the facilitation/inhibition of motor responses from the motor cortex.This lycra garment can assist and lead to motor learning and neural integration. alignment, postural stability and sensory feedback. This is thought to be due to the stimulation of the somatosensory and musculo-skeletal systems which give changes in tone and postural alignment. This will then lead to improved proximal stability and improved biomechanical advantage for muscle activation and enhancement of lenaring strategies.